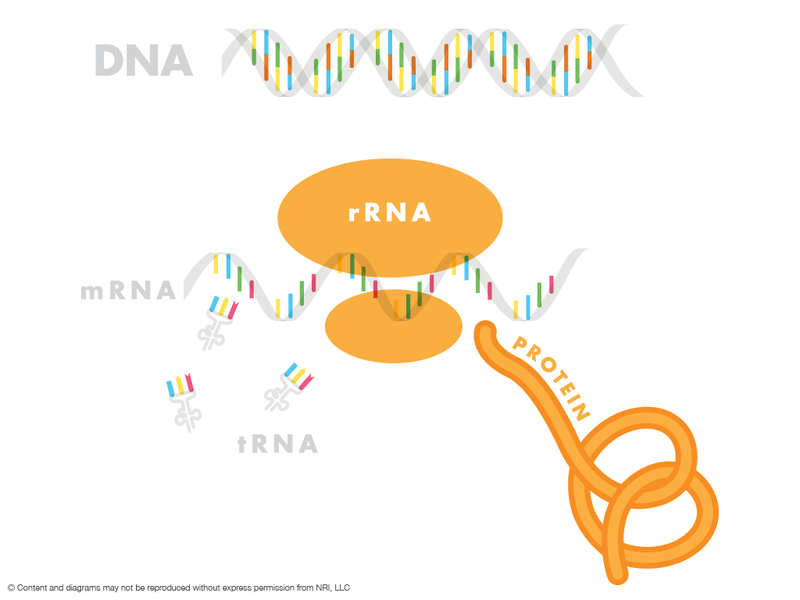 While RNA can break down into individual nucleotides in the body, there are specific roles played by the intact RNA molecules themselves. There are several types of RNAs made by the body. Different species of each of these RNAs may be necessary for the optimal functioning of the various organs in the body. The differential effects of various RNAs on unique systems can be seen in the wide diversity of literature that supports the use of RNA as essential nutrients in the body. These RNAs have been demonstrated to have specific effects on various organs, tissues or systems in the body. 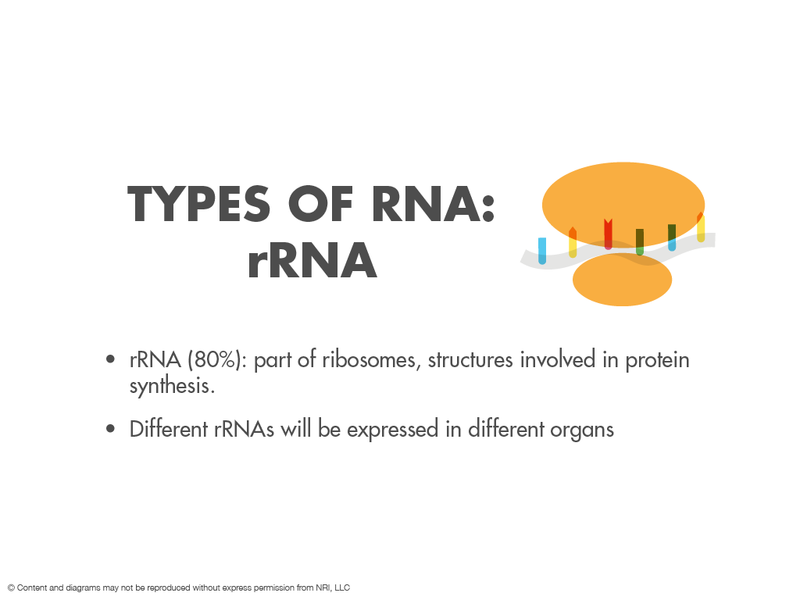 The three most well characterized types of RNA are messenger RNA, ribosomal RNA and transfer RNA. 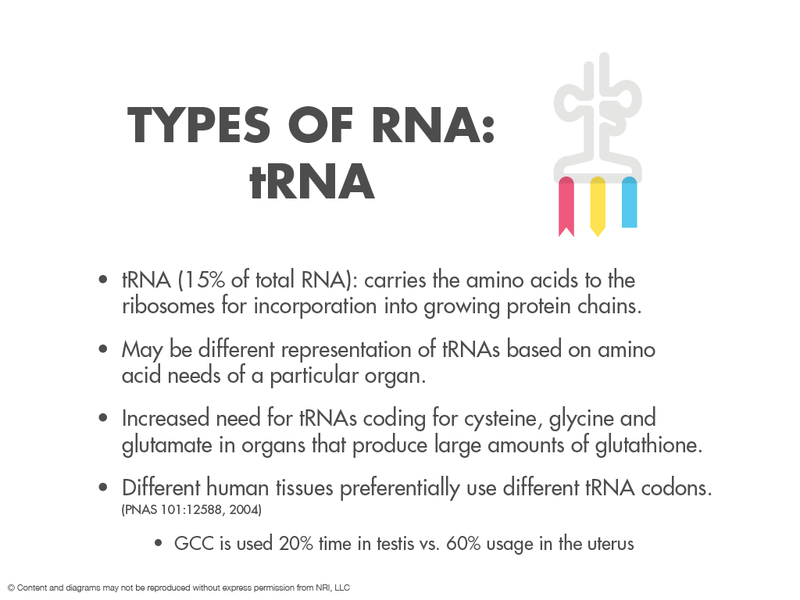 Ribosomal or rRNA is the most abundant class of RNA representing 80% of the total RNA in our cells. Recent work from Ambion has demonstrated different distributions of rRNAs in various organs in the body (Palmer M. Ambion Technotes 11, 2004). Ribosomal RNA is an integral part of the ribosomes, the “snow man” looking structures in the cell that are involved in protein synthesis. In our home supply store model ribosomal RNA could be viewed as the “tools” that are needed to build our sunroom or our bathroom. Regardless of what room we are building we will need tools to convert our building supplies into a finished product. In a similar fashion we need ribosomes to build our proteins from the DNA template and the RNA messages. 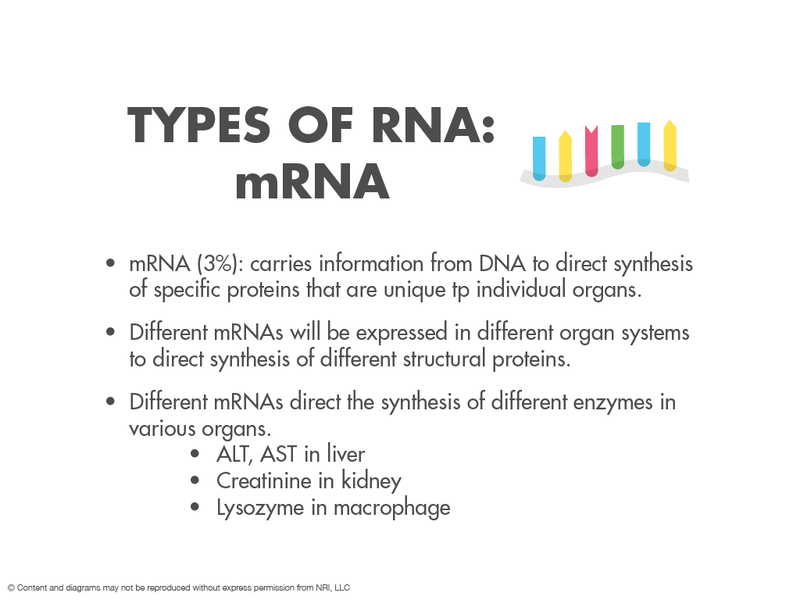 Messenger RNA or mRNA is the RNA that carries the information from DNA to direct the synthesis of specific proteins that are unique to individual systems in the body. By necessity, the body has different mRNAs in different organs. 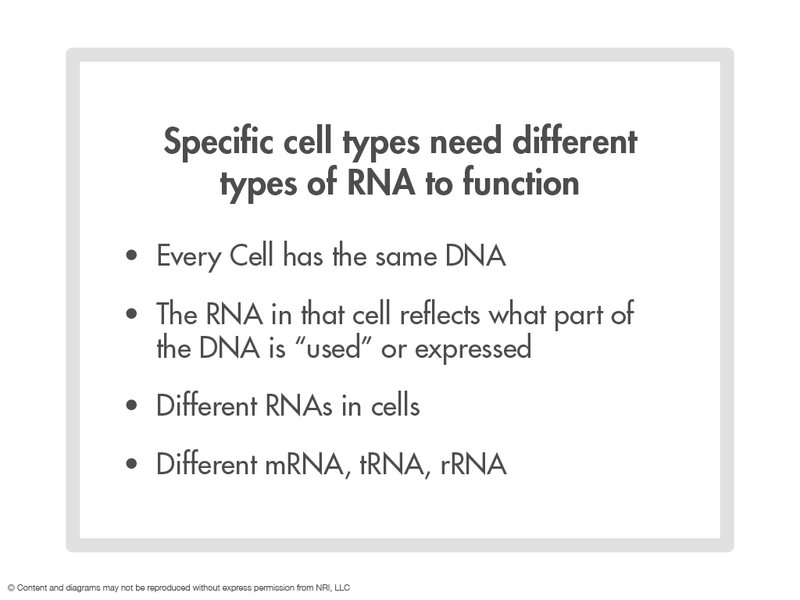 mRNA accounts for only 3% of the total RNA in a cell. Just as the different organs of the body use different messages, so too do the different rooms in a home that we are constructing require different building supplies and materials. In our model the messenger RNA would be the exact supplies that we need to build our final product, sun room supplies for a sunroom and bathroom building products to build the bathroom. Transfer RNA actually carries amino acids to the ribosomes for incorporation into growing peptide chains. 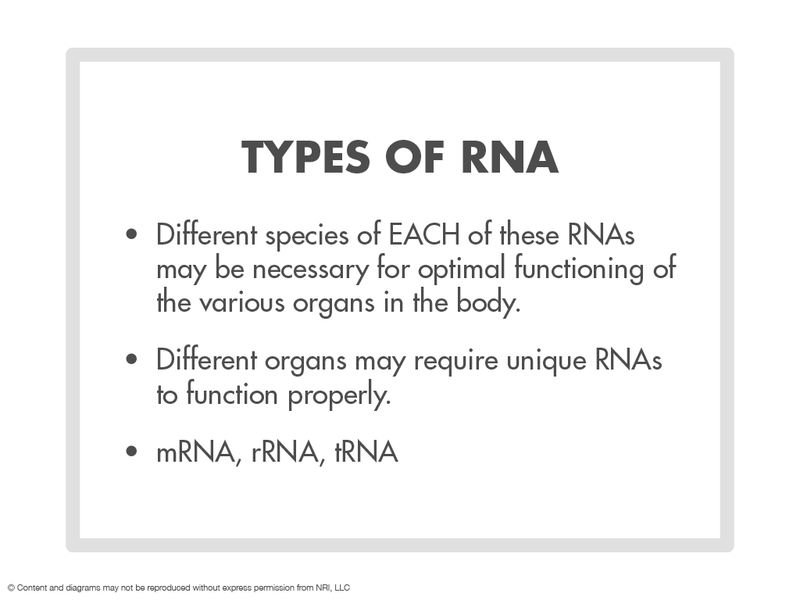 Transfer RNA represents 15% of the RNA in each cell. There may be different representations of the various tRNAs in cells based on specific amino acid needs of a particular protein in an individual organ. Going back to our model again, the transfer RNAs could be viewed as the subcontractors on a building construction site that bring the specific supplies and tools needed for their particular trade. In our bathroom addition we will need more plumbers and more plumbing supplies. In the sunroom we need more windows and perhaps more heat or air conditioning to keep the temperature of the room comfortable. This would mean that we may need heating and air conditioning contractors for our sunroom whereas these contractors will have more limited work in our bathroom. In recent years it has become clear that there are a number of RNAs that do not fit into these three nice neat categories. These “non coding RNAs” or nc RNAs, include such diverse functions in the cell as regulation of transcription, replication of chromosomes, RNA processing, RNA modification, RNA editing, mRNA stability and degradation, regulation of translation and protein translocation (Storz,G. Science 296, 2002). In our construction model this would be equivalent to having employees of your home supply store that help you decide which boards to use, carrying your supplies to the car, cutting down some of the boards to the right size for you, weatherproofing the wood or actually coming to the job site to help you construct your rooms. The overall purpose of any of these RNAs is to help convert the total information potential contained in the DNA into a final protein product that can perform a discrete function and to oversee the process so that it runs smoothly. 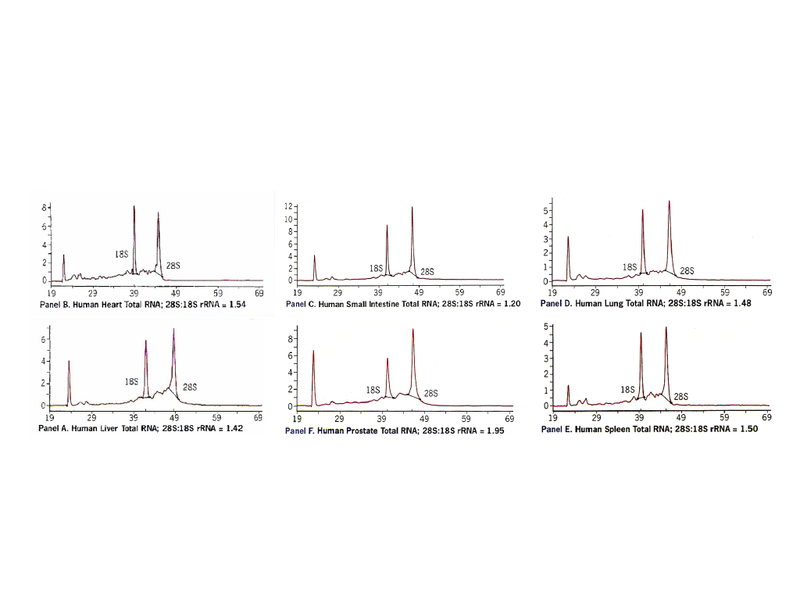 So it is easy to envision all the steps where you would need tools or helpers or supplies for this process and easy to see why there might be so many different varieties and types of RNA. Some specific examples of these ncRNAs include telomere RNA, siRNA, tmRNA, gRNA, snoRNA, snRNA, miRNA and signal recognition particle RNA among others. 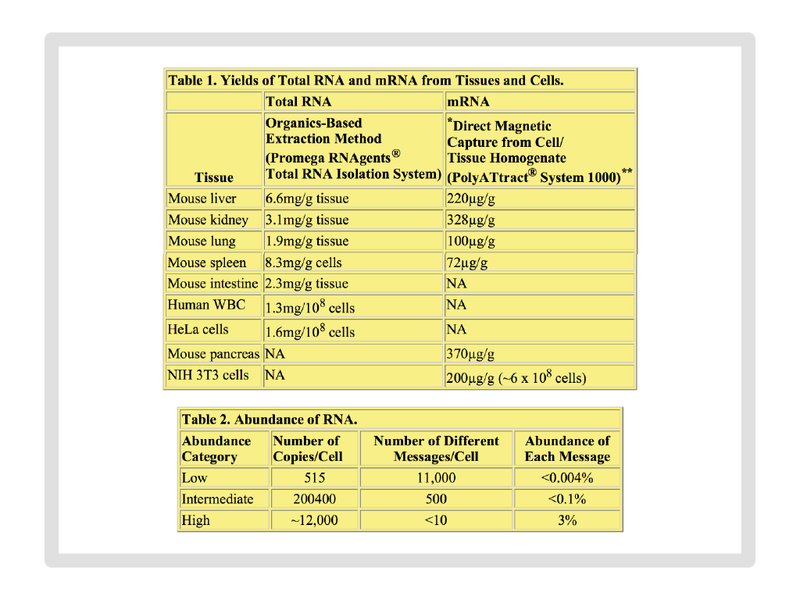 In terms of alternative and nutritional uses of RNA, the expectation is that this area will continue to explode. The recognition and acknowledgment that dietary nucleotides are required nutrients in a variety of what appears to be chronic or inflammatory health conditions is a huge breakthrough. 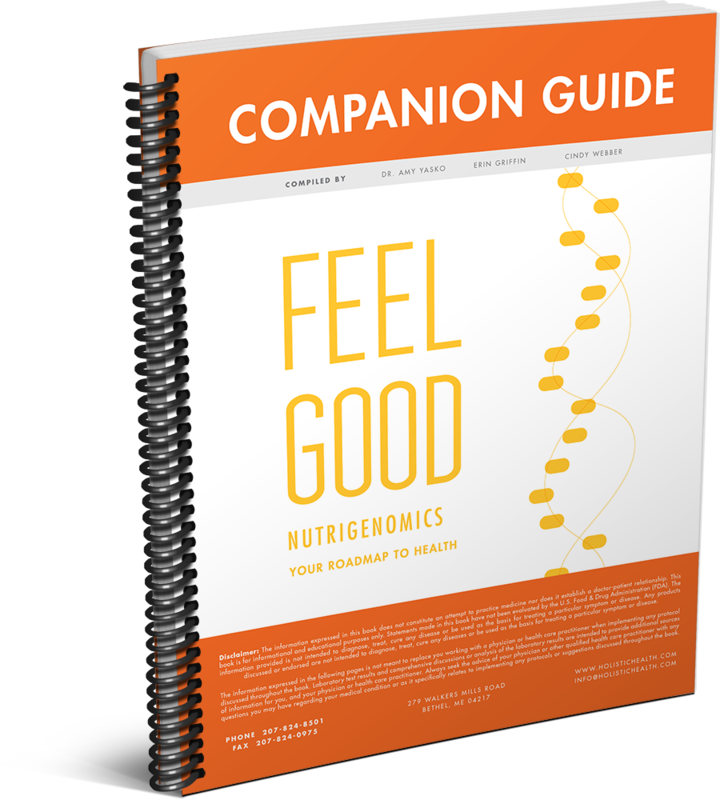 The vast literature continues to mount supporting the use of RNA and nucleotides as foods for specific nutritional or organ imbalances in the body. A clear distinction can be made between unmodified RNA that is safe and is ingested on a regular basis in our foods every day and the modified backbones of RNA that are utilized to produce the compounds used in molecular medicine.